The gravestones at Arlington National Cemetery are marked by U.S. flags each Memorial Day. Arlington National Cemetery is a cemetery in Arlington County, Virginia. People who served in the United States military are buried here. The cemetery started during the American Civil War. It is on a big farm called Arlington House. Arlington House was the home of Mary Anna Custis Lee. Mary Anna Custis Lee was a great-granddaughter of Martha Washington. She was also the wife of Confederate general Robert E. Lee. Although most of the farm now has graves, the old farmhouse still stands in the middle of the cemetery. The cemetery is across the Potomac River from the Lincoln Memorial in Washington, D.C.. The cemetery covers 624 acres (2.53 km2). People who died serving the United States in a war, and military veterans are allowed to be buried in the cemetery. People are buried here who fought in wars from American Civil War to the military actions in Afghanistan and Iraq. People who were buried here before the Civil War were reburied after 1900. Arlington National Cemetery is taken care of by the United States Army. Arlington House (Custis-Lee Mansion) and its land are taken care of by the National Park Service as a memorial to Lee. Recently, the way the cemetery is managed caused controversy. George Washington Parke Custis was the grandson of Martha Washington, and grew up with Martha and George Washington. He got the land that now is Arlington National Cemetery in 1802. He began building Arlington House, where he lived with his wife Mary Lee Fitzhugh Custis. The land and house was given to their only child that lived to be an adult, Mary Anna Custis Lee. She was married to Robert E. Lee, a West Point graduate and United States Army officer. When Fort Sumter was forced to surrender at the beginning of the American Civil War, President Abraham Lincoln asked Lee to be the general of the federal army. Lee did not give an answer right away, but waited to see if his home state of Virginia would leave the Union. Lee left the federal army when Virginia said it was leaving the United States. He decided he could not fight against his home state. He became the leader of the armed forces of the Commonwealth of Virginia. He then became commander of the Army of Northern Virginia. Lee was a great commander and won several battles against the Union forces. Most Union officers thought Lee had broken his promises to the Union because he chose to fight against them. Part of Arlington was taken away from the Lee family and became a graveyard. Mostly Union dead are buried there. Before the Civil War, the United States did not have large military-only cemeteries. Important generals were buried in the Congressional Cemetery with other important leaders. American military cemeteries were needed on distant frontiers, and near battles and hospitals where many soldiers died. When dead Civil War soldiers filled the burial grounds near Washington, D.C., Quartermaster General Montgomery C. Meigs proposed in 1864 that 200 acres (81 hectares) of the Robert E. Lee family property at Arlington be taken for a cemetery. During the Civil War, people invented tricks to capture or to make life hard for Americans that fought on the other side of the war. The government assessed taxes on properties and insisted that the owners appear in person to pay them. If the plantation owner did not come, the government would sell the land. The government bought Arlington at tax sale in 1864 for $26,800. Mrs. Lee did not show up in person, but rather had sent an agent to pay the $92.07 in property taxes that were owed for the land. The government turned away her agent, refusing to accept the tax payment. In 1874, Custis Lee, heir under his grandfather's will passing the estate in trust to his mother, sued the United States claiming ownership of Arlington. After the U.S. Supreme Court ruled 5-4 in Lee's favor in United States v. Lee, deciding that Arlington had been taken illegally, Congress returned the land to him. The next year, Custis Lee sold it back to the government for $150,000. Custis Lee and Robert Todd Lincoln, Secretary of War and son of President Lincoln, were both present when the property was officially turned over to the government. In 2011, Hurricane Irene killed six large trees at the cemetery. The 220-year-old "Arlington Oak" fell down near the grave of John F. Kennedy. Arlington National Cemetery is divided into 70 sections, with some sections in the southeast part of the cemetery saved for future use. Section 60, in the southeast part of the cemetery, is the burial ground for military personnel killed in the Iraq War and the War in Afghanistan. In 2005, Arlington National Cemetery bought another 12 acres (4.9 hectares) from the National Park Service, along with 17 acres (6.9 hectares) from the Department of Defense that was part of Fort Myer and 44 acres (18 hectares) that is the site of the Navy Annex. Section 21, also known as the Nurses Section, is the area of Arlington National Cemetery where many nurses are buried. The Nurses Memorial is there. In the cemetery, there is a Confederate section with graves of soldiers of the Confederate States of America and a Confederate Memorial. All Confederate headstones are peaked rather than rounded. In Section 27, there are buried more than 3,800 former slaves, called "Contrabands" during the Civil War. Their headstones are designated with the word "Civilian" or "Citizen". The cemetery had allowed privately-purchased markers in certain burial areas. Since 2001, the areas that the cemetery permitted such markers in are filled. The older sections of the cemetery have many different private markers, including artillery pieces. 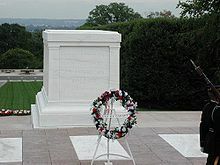 The Tomb of the Unknowns at Arlington National Cemetery is also called the "Tomb of the Unknown Soldier". It stands on top of a hill overlooking Washington, D.C. It honors soldiers who died without their bodies being identified. The Tomb is one of the more popular sites at the Cemetery. The tomb is made from Yule marble quarried in Colorado. It consists of seven pieces, with a total weight of 79 short tons (72 metric tons). The tomb was completed and opened to the public April 9, 1932, at a cost of $48,000. U.S. Army guards have stood watch at the Tomb of the Unknowns at all times since July 2, 1937. The 3rd U.S. Infantry Regiment ("The Old Guard") began guarding the Tomb April 6, 1948. The Tomb of the Unknowns is part of the Arlington Memorial Amphitheater. The Memorial Amphitheater has hosted state funerals and Memorial Day and Veterans Day ceremonies. Ceremonies are also held for Easter. About 5,000 people attend these holiday ceremonies each year. The structure is mostly built of Imperial Danby marble from Vermont. The Memorial Display room, between the amphitheater and the Tomb of the Unknowns, uses Botticino stone, imported from Italy. The amphitheater was the result of a campaign by Ivory Kimball to construct a place to honor America's soldiers. Congress authorized the structure March 4, 1913. Woodrow Wilson laid the cornerstone for the building on October 15, 1915. The cornerstone contained 15 items including a Bible and a copy of the Constitution. The Netherlands Carillon is a carillon (bell tower) that was a gift from the Netherlands to the people of the United States in 1954, in thanks for their efforts during World War II. The bells are played by people with special training. This happens regularly during the summer and on special days. Recorded tunes are played on the hour and during the day. It is next to Arlington National Cemetery, on the north side. Remembering the Maine: The memorial to the USS Maine. It is now hard to find space to build new memorials at the cemetery. The army worries that new memorials take up space that could otherwise be used for graves. The army requires a joint or concurrent resolution from Congress before it will place new memorials onto the cemetery grounds. Still, there are several memorials on the cemetery grounds, and groups regularly ask for space for new memorials. The Space Shuttle Challenger Memorial was dedicated on May 20, 1986, in memory of the crew of flight STS-51-L, who died during launch on January 28, 1986. Written on the back of the stone is the text of the John Gillespie Magee, Jr. poem High Flight. Although many remains were identified and returned to the families for private burial, some were not, and were laid to rest under the marker. Two of the crew members, Scobee and Smith, are buried in Arlington, as well. There is a similar memorial to those who died when the Shuttle Columbia broke apart during reentry on February 1, 2003. It was dedicated on the first anniversary of the disaster. Astronauts Laurel Clark, David Brown and Michael Anderson are also buried in Arlington. The Cairn, the Lockerbie memorial is a memorial to the 270 killed in the bombing of Pan Am Flight 103 over Lockerbie, Scotland. The memorial is made up of 270 stones, one for each person killed in the disaster. In section 64, there is a memorial to the 184 victims of the September 11 attacks on the Pentagon. The memorial takes the shape of a pentagon, and lists the names of all the victims that were killed. There are only two mausoleums located within the confines of the cemetery. One is for the family of General Nelson Appleton Miles in Section 3 and the other one belongs to the family of General Thomas Crook Sullivan and it is in Section 1. There is a Commonwealth Cross of Sacrifice with the names of all the citizens of the USA who lost their lives fighting in the Canadian forces during the Korean War and the two world wars. The Women in Military Service for America Memorial is at the Ceremonial Entrance to Arlington National Cemetery. Eternal flame and marker at the grave of John F. Kennedy, 35th president of the United States, as it appeared prior to the parallel interment of his widow, Jacqueline Kennedy, upon her death. The first soldier to be buried in Arlington was Private William Henry Christman of Pennsylvania on May 13, 1864. George Washington Parke Custis, founder of Arlington Plantation, grandson of Martha Washington, step-grandson of President George Washington, father to Mary Anna Custis Lee. Mary Lee Fitzhugh Custis, wife to George Washington Parke Custis, daughter of William Fitzhugh and Ann Bolling Randolph Fitzhugh, mother to Mary Anna Custis Lee. Albert Sabin, scientists who helped develop an oral polio vaccine. Charles Durning, actor and personality. Phyllis Kirk, famous TV and movie actress, alongside her husband. James Parks, freedman, the only person buried at Arlington Cemetery who was born on the grounds. Mary Randolph, first person to be buried at Arlington Plantation, descendant of Pocahontas and John Rolfe, cousin to Mary Lee Fitzhugh Custis. Marie Teresa Rios, author of Fifteenth Pelican, basis for The Flying Nun television show. Leslie Sherman, student killed in the 2007 Virginia Tech massacre (her parents Holly and Anthony Sherman are both veterans and will be buried next to their daughter). Whether or not they were wartime service members, U.S. presidents are eligible to be buried at Arlington, since they oversaw the armed forces as commanders-in-chief. Four state funerals have been held at Arlington: those of Presidents William Howard Taft and John F. Kennedy, that of General John J. Pershing, and that of U.S. Senator Edward M. Kennedy. As of May 2006, there were 367 Medal of Honor recipients buried in Arlington National Cemetery. Nine of these recipients are Canadians. Omar Nelson Bradley (1893–1981), commanded the 12th Army Group in Europe during World War II, first Chairman of the Joint Chiefs of Staff and the last living five star general. Frank Buckles (1901–2011), last known American veteran of World War I.
Omar Bundy (1861–1940), World War I Major General who commanded the 1st Brigade, 1st Expeditionary Division in France, awarded the French Legion of Honor and the Croix de Guerre. John Allen Campbell (1835–1880), Brevet Brigadier General; American Civil War, first Governor of Wyoming Territory in 1869 and Third Assistant Secretary of State. Claire Lee Chennault (1893–1958), was a United States military aviator who commanded the "Flying Tigers" during World War II. Charles Austin Coolidge (1844–1926), Brigadier General, served in Civil War, Indian Wars, Spanish-American War, Philippine-American War and the China Relief Expedition. William P. Cronan (1879–1929), US Naval officer and 19h Naval Governor of Guam. Scott Crossfield (1921–2006), US Naval aviator and test pilot, first to fly at twice the speed of sound; played a major role in the design and development of the North American X-15. Frank J. Fletcher (1885–1973), Admiral, U.S. Navy, World War II; operational commander at Coral Sea and Midway; awarded Medal of Honor. John Gibbon (1827–1896), Brigadier General, Union Army, Civil War, most notably commander of 2nd Division, US II Corps that repelled Pickett's Charge at the Battle of Gettysburg. James Jabara (1923–1966), the first American jet ace in history. He's credited with shooting down 15 enemy aircraft during aerial combat. Henry Louis Larsen (1890–1962), Marine Lieutenant General; commanded the first deployed American troops in both World Wars; Governor of Guam and American Samoa. John S. McCain, Sr. (1884–1945), USN Admiral – grandfather of Senator John McCain and father of McCain Jr.
Montgomery Cunningham Meigs (1816–1892), Brigadier General. Arlington National Cemetery was established by Brig. Gen. Montgomery C. Meigs, who commanded the garrison at Arlington House and took over the grounds on June 15, 1864, for use as a military cemetery. He wanted to make the house not usable for living, in case the Lee family tried to return. A stone and masonry burial vault in the rose garden, 20 feet (6.1 m) wide and 10 feet (3.0 m) deep, and containing the remains of 2,111 Civil War dead, was among the first monuments to Union dead erected under Meigs' orders. Meigs himself was later buried within 100 yards (91 m) of Arlington House with his wife, father and son. Glenn Miller (1904–1944), Major and well known band leader who disappeared over the English Channel while flying to Paris. His body was never found, but he has a memorial headstone. Audie Murphy (1924–1971), U.S. Army, Recipient of the Medal of Honor, actor, and the most decorated U.S. Soldier during World War II. Edward Ord (1818–1883), Major General, Army of the James during the Appomattox Campaign, Union Army, Civil War. David Dixon Porter (1813–1891), Admiral, Union Navy, Civil War, most notable as the Union naval commander during the Vicksburg Campaign, a turning point of the war, which split the Confederacy in two. Robert F. Sink (1905–1965), Lt. General, and former Regimental Commander of the 506th Parachute Infantry Regiment, 101st Airborne Division, portrayed by Vietnam Veteran, and retired Marine Captain Dale Dye in the HBO/BBC miniseries Band of Brothers. Walter Bedell Smith (1895–1961), General, U.S. Army, World War II, Dwight D. Eisenhower's Chief of Staff during Eisenhower's time at SHAEF and Director of the CIA from 1950 to 1953. Also served as U.S. Ambassador to the Soviet Union from 1946 to 1948. Lauri Törni, a.k.a. Larry Thorne (1919–1965), Finnish soldier who served in the US special forces and was a World War II veteran; called "soldier who fought under three flags (Finland, Germany and USA)". Warrant Officer Gregory S. Crandall's helicopter was shot down over Savannakhet province, Laos, on February 18, 1971. In May of that year the military listed him KIA. According to Arlington National cemetery records John Manning, chief of the Army's Mortuary Affairs Branch stated that witnesses to the crash reported that the ..."helicopter burst into flames and exploded when it hit the ground.". It was also reported that there were a series of seven explosions. The remains of Crandall and two other soldiers were recovered in February 1991 and on September 17, 1993, with full military honors, a full sized steel casket, and at the protest of the family, the remains of Warrant Officer Gregory S. Crandall, a single No. 4 maxillary premolar tooth, was buried. Grave marker of slain civil rights leader Medgar Evers. William Francis Buckley, CIA Station Chief, murdered in Beirut. Oliver Wendell Holmes, Jr, Associate Justice of the Supreme Court of the United States, wounded three times in the Civil War, "The Great Dissenter"
Edward Stanley Kellogg (1870–1948), U.S. Navy Captain, 16th Governor of American Samoa (1923–1925). Edward M. Kennedy (1932–2009), U.S. Army Veteran (1951–1953), U.S. Senator from Massachusetts (1962–2009). John F. Kennedy (1917–1963), U.S. Navy officer during World War II, U.S. Representative (1947–1953), U.S. Senator (1953–1961), President of the United States, (1961–1963). Robert F. Kennedy (1925–1968), Navy veteran, Attorney General of the United States (1961–1964), U.S. Senator from New York (1965–1968). 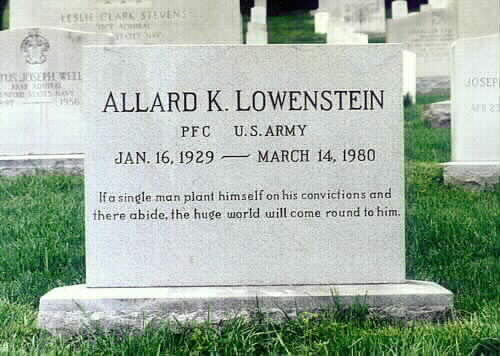 Allard Lowenstein, U.S. Congressman from New York. Earl W. Renfroe, orthodontist who helped originate the concept of preventive and interceptive orthodontics. Samuel W. Small, journalist, evangelist, prohibitionist. Johnny Micheal Spann, CIA officer, first American killed in Afghanistan. Although Spann had served in the USMC, he was not in the military when killed. However, because he had received the CIA's Intelligence Star, considered the equivalent of the US Military's Silver Star and recognized as such by President George W. Bush, Spann was approved for burial in Arlington National Cemetery. ↑ "Will of George Washington Parke Custis". www.nathanielturner.com. ↑ The Civil War: An Illustrated History, Geoffrey Ward, with Ken and Rick Burns. 2045. ISBN 0-679-74277-8. ↑ Hughes, Mark (1995). Bivouac of the Dead. Heritage Books. p. 265. ↑ 5.0 5.1 "Arlington House - About Arlington House". ↑ Hughes, Mark (1995). Bivouac of the Dead. Heritage Books. p. 266. ↑ "Hurricane Irene's bluster fells historic Arlington Oak". Washington Post. September 2, 2011. p. B5. ↑ "Interactive Map". Arlington National Cemetery. Retrieved 2009-08-05. ↑ "Mementos adorn 'saddest acre'". CNN. 2009-05-23. Retrieved 2009-08-05. ↑ Williams, Rudi (May 27, 2005). "Arlington National Cemetery Gains 70 Acres of Land". American Forces Press Service. Retrieved 2009-08-05. ↑ "Arlington National Cemetery – Nurses Memorial". Retrieved 2009-08-05. ↑ "Confederate Memorial". Retrieved 2009-08-05. ↑ Support, Enterprise Wen and Infrastructure. "404 - page not found". www.cem.va.gov. ↑ "Arlington Cemetery - Covering News, How-tos and Personal Stories". arlingtoncemetery. ↑ "Wallace Fitz Randolph, Major General, United States Army". www.arlingtoncemetery.net. ↑ "Lockerbie Memorial Cairn: Arlington National Cemetery". www.arlingtoncemetery.net. ↑ "Arlington National Cemetery Section 27 facts". Arlington National Cemetery. Retrieved 2009-04-25. ↑ Medal of Honor Recipients Buried at Arlington National Cemetery, Arlington National Cemetery. Retrieved on April 9, 2006. ↑ Paul Duggan (March 15, 2011). "Frank Buckles, last U.S. vet­eran of World War I, laid to rest at Arlington". The Washington Post. https://www.washingtonpost.com/local/frank-buckles-last-known-us-world-war-i-veteran-is-laid-to-rest-at-arlington/2011/03/10/ABHVLFZ_story.html. Retrieved March 16, 2011. ↑ "Gregory Stephen Crandall, Chief Warrant Officer, United States Army". www.arlingtoncemetery.net. Poole, Robert M., On Hallowed Ground: The Story of Arlington National Cemetery, Walker & Co, 2009. 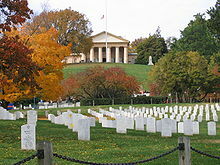 Wikimedia Commons has media related to Arlington National Cemetery. "Arlington National Cemetery website". Retrieved March 11, 2010. "National Park Service site". Retrieved March 11, 2010. "Interment Information". Retrieved March 11, 2010. "Fallen Heroes Project on Display at Arlington National Cemetery". Retrieved March 11, 2010. "Arlington Cemetery: Hallowed Ground". Life magazine. Retrieved March 11, 2010.